2pm: Hyde County Board of Education meeting @ Ocracoke Community Center. 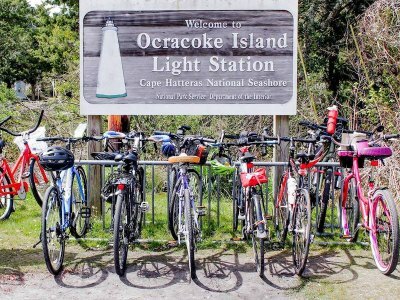 Twice a year the BOE meets on Ocracoke so we can attend in person. All are welcome. There is a public comment period. 4pm: Home baseball game @ Community Park. Ocracoke Varsity vs. Bear Grass. Go Dolphins! 1pm: NPS Year-in-Review presentation @ Community Center Superintendent David Hallac invites the community to discuss an overview of the 2018 season, and ask questions about 2019. Dave will review visitation patterns and park activities during 2018 at Cape Hatteras National Seashore, Fort Raleigh National Historic Site, and Wright Brothers National Memorial. 2:40pm: Ocracoke School Awards Assembly in the school gym. Honor Roll and Principal's List for 3rd nine weeks will be announced. 4pm: Home Middle School baseball game @ Community Par. Middle School Dolphins vs. Columbia Wildcats. Fear the Pod! 7pm: Occupancy Tax Board meeting @ Community Center. This is the annual meeting when the local non-profits and governmental orgs come to the occupancy tax board and ask for their annual appropriations. Good times. Graceful bakery opens for the season. NPS Campground opens for the season. 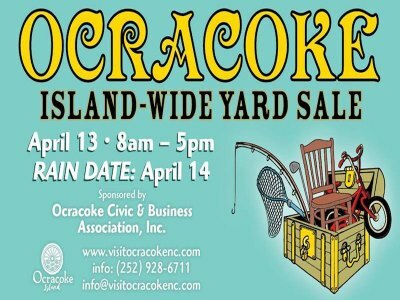 8am: Island-Wide Yard Sales! Get your map to over 33 locations at the Variety Store or the little visitor center in the Community Square. 8am: Beach Clean-Up, 8am-Noon. Meet @ the Lifeguard Beach parking lot for bags, etc. Save the Date! Future beach cleanup events will be held June 22 and September 21, 2019. 4pm: Open House @ OPS Museum. All are welcome to come out and see the new exhibits, new Gaskill family tree, and new gift shop items! 7pm: Salem Select Choir Concert @ OUMC. The Salem Select Girls Choir, under the direction of Lynne German, are bringing their show choir to Ocracoke for performances and workshops at Ocracoke School, followed by a FREE community concert at Ocracoke United Methodist Church on Saturday evening at 7pm. All are welcome to hear these amazing singers share music from a variety of genres from classical to spiritual to pop and rock.